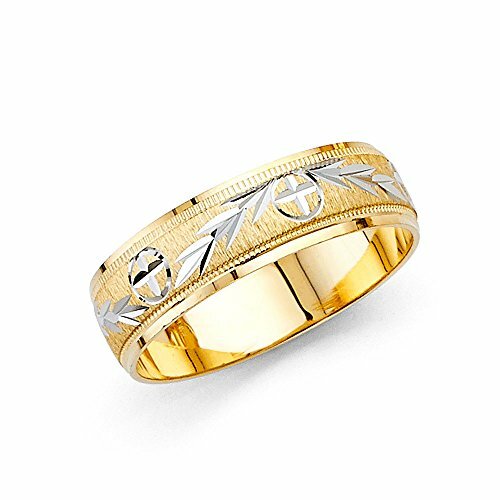 Wellingsale 14k Two 2 Tone White and Yellow Gold Polished Satin 6MM Diamond Cut Comfort Fit Wedding Band Ring - Size 9.5 by Wellingsale® at SCRHI. MPN: SFP-J-LGDI-BF-00004-095. Hurry! Limited time offer. Offer valid only while supplies last. WELLINGSALE® Features:1. Stunning High Polished Finish2. Made using only the most premium and pure materials3. Non tarnish, Stunning Color4. - Other: Browse Our Catalog for an available matching set!